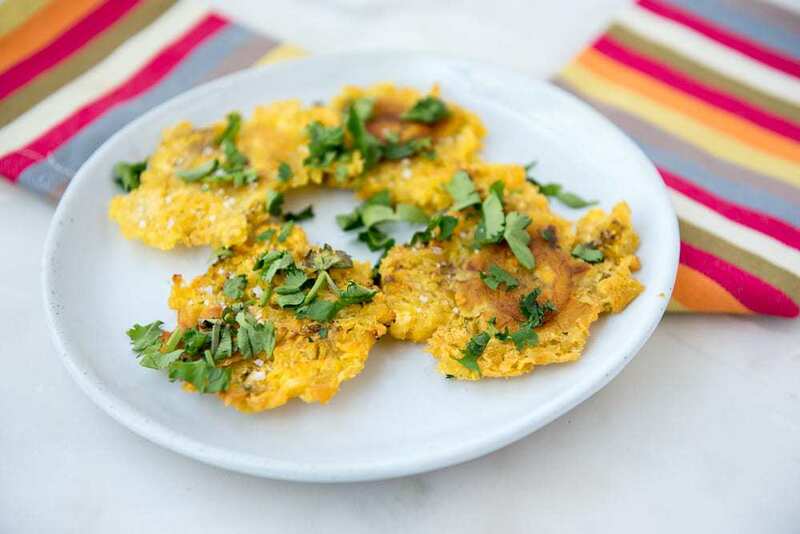 Patacones or Tostones are simply twice-fried green plantains and make the most delicious crunchy snack or side dish to a meal. The best part? 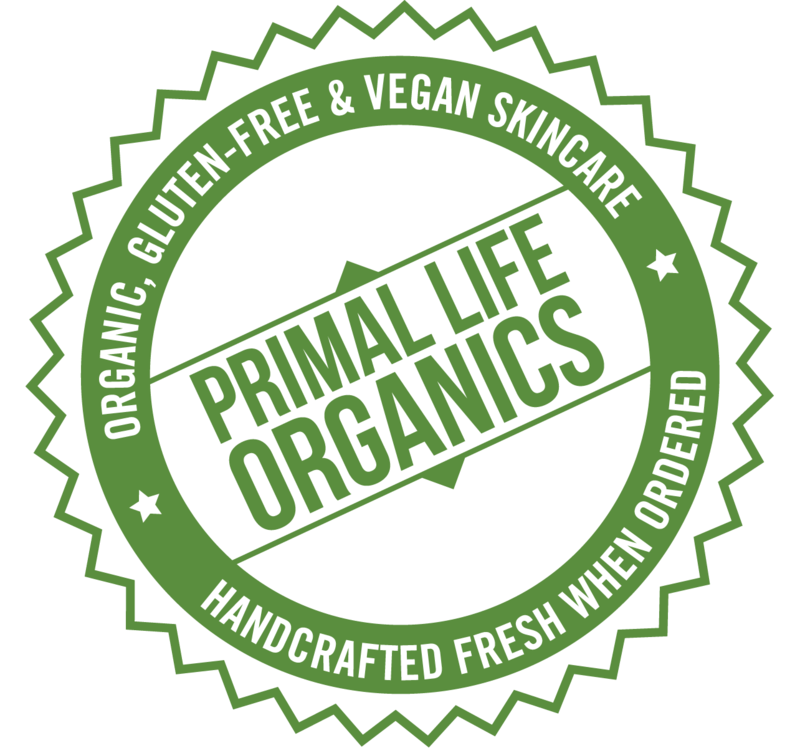 Because they are only 3 ingredients, they are Paleo as well as AIP, Whole30, gluten-free, and dairy-free! In this post I show you how to make them. 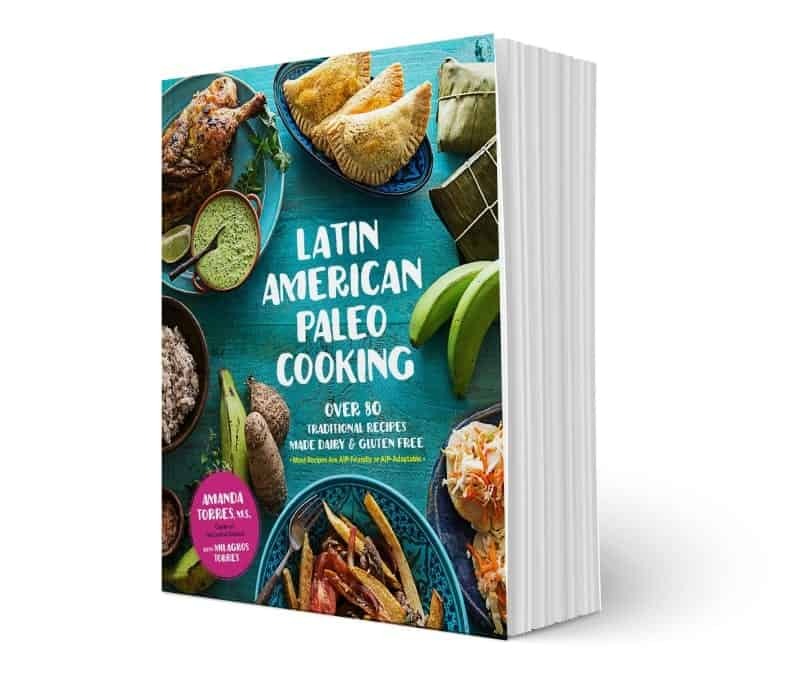 This post contains affiliate links and I received a copy of Latin American Paleo Cooking for review. All opinions are my own. I am a participant in the Amazon Services LLC Associates Program, an affiliate advertising program designed to provide a means for us to earn fees by linking to Amazon.com and affiliated sites. When we went to Costa Rica a few years ago (I wrote about what we ate in this post), patacones (or tostones as they are called in some countries) were one of my most favorite things. There the patacones were the size of dinner dishes and fried to utter perfection. We ate them both plain and then topped with so many different things – guacamole and fresh salsa, braised beef, pork, a bean mixture, some mango salsa, and I even had them one morning topped with rice, beans, and fried eggs. Since that trip, we've had them at home several times, but we often use them as a base under some pulled pork and mango salsa. It's just such a perfect combo. However, because they are so easy to make and offer a hearty kind of starch to any meal, they are perfect for a lot more than just that. Ok, now that you should no longer be intimidated and realize you too can fry, smash, fry, let's learn how to make more delicious Latin American food. Oh, and I have the recipe for these patacones down below. 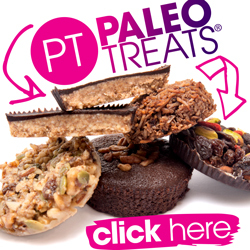 over 80 traditional recipes that are authentic as possible and have been made Paleo. 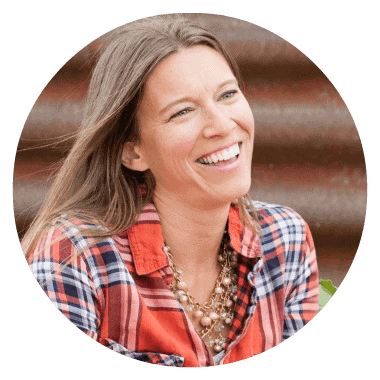 Over 90% of them are also Autoimmune Paleo-compliant (AIP). All of this I mention because I know quite a few of you are either living in a Latin American country or are of Latin American descent and aren't sure how to continue eating your favorite foods from your culture. Cultural foods are one of the hardest sometimes to let go of when going on a restricted diet, whether because you have to because of a newly discovered food allergy/sensitivity or because you heard a Paleo diet can help heal you or help you lose weight. It's resources like this then that are SO valuable because they essentially allow you to continue to carry on your traditions but also allow you to feel better too. One of my favorite parts of this book is that there are some really delicious-looking recipes for starchy sides. If you too get sick of cauliflower rice (a) there are some flavor combos for cauliflower rice that you might want to try out to see if that makes a difference but also, (b) Amanda gives a few other alternatives that go well with stews or other places that you might want rice. My family eats white rice a few times a month, but I find us reverting to white rice as a regular staple sometimes because I'm not sure of other alternatives. I don't really want to get into that rut, so I'm excited to try these other recipes out. One of them is a “rice” made of a malanga root (with a taro root variation) that looks really good. I couldn't find malanga root at my local store so I bought a taro root and plan to try this one out this week. There are also some plantain recipes that look like they will go nicely with some dishes I have my eyes on. If you go to the store and can't find any green plantains, ask an employee of the store to see if they might have some in the back. I've been lucky quite a few times to score green plantains this way. You can do the smashing step in several different ways. Amanda recommends using a tostonera press, which is under $10 and you can either get it your local store or on Amazon here. I personally use either our tortilla press (this is the one I have) because it does both tortillas and patacones, the bottom of a bowl or pan, or a meat mallet. You can also use the bottom of a glass or even your hand if you want too (though if the plantain is still hot from the 1st fry, be careful not to burn yourself). Also, if you use a bowl, glass, or pan, you might have to press pretty hard to make sure the plantain is flat enough. And if you use a meat mallet you have to be careful not to whack it too hard or it will break apart. Long story short, you can make these a ton of different ways. Use whatever one works best for you, the space you have in your kitchen, and your budget. 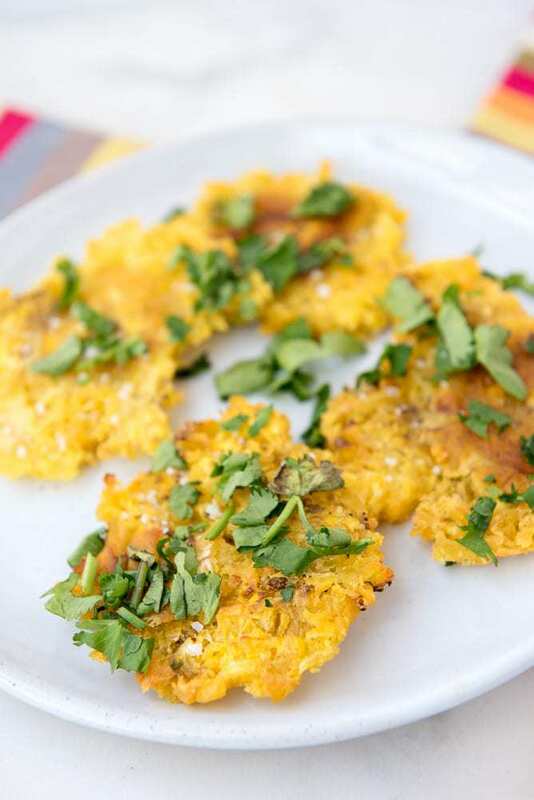 Patacones/Tostones (fried green plantains) make the most delicious crunchy snack or side dishl. Only 3 ingredients and they're Paleo, AIP, Whole30, gluten-free, and dairy-free, and nut-free. a bowl of water with about 1 tablespoon (6 g) of salt for 10 to 15 minutes. Slice the peeled plantain crosswise into disks to 1 inch (2 to 2.5 cm) wide. In a large skillet, heat your fat of choice over medium heat until shimmering, 3 to 5 minutes. they have turned a darker, more golden color. Do not allow to brown. circle and then clamp down the lid on top. Add extra cooking fat as needed, because these will absorb quite a bit of fat as they cook. tostones do not reheat well. Serve with your favorite main dish. This dish is AIP compliant: No adjustments necessary! Recipe Reprinted with permission from Latin American Paleo Cooking by Amanda Torres with Milagros Torres, Page Street Publishing Co. 2017. Disclaimer: This post may include affiliate links. This means I might receive a small amount of compensation if you purchase something through one of the links. This does not mean the price will be any greater for you, in fact, I might be able to negotiate even better prices and discounts for you. The compensation I receive helps me pay for the cost of running this blog and bringing you all of this free information. Thanks in advance for supporting me! . Wow, this dish looks delicious! I had never even heard of this type of recipe. I need to get some plantains ASAP! Yum yum yum! I had never had tostones before I recieved Amanda’s amazing book! We are loving this cookbook! I used to think potato chips were my ultimate weakness until I had tostones – those crispy edges have my mouth watering right now! LOVE her book and these tostones! I just made them for my dinner tonight, they’re a favorite in my home. This is actually the first recipe I tried from the book and I love it so much. So crispy and addicting! These look so crispy and delicious! I love your video of them-yum! I need to try them! I love how simple the recipe is! Looks delicious! I love tostones! My grandma always made the best ones….. but the recipe in Amanda’s book is one my even my Abuela would get behind! Love this book so much! Yes, yes, and more yes!! I love this. Patacones with pulled pork is my JAM. This is so simple and easy to put together. I’ve been wanting to try it and now I know how to make it ! Thanks ! I LOVE tostones. These look amazing! YUM!!!! The look incredible! 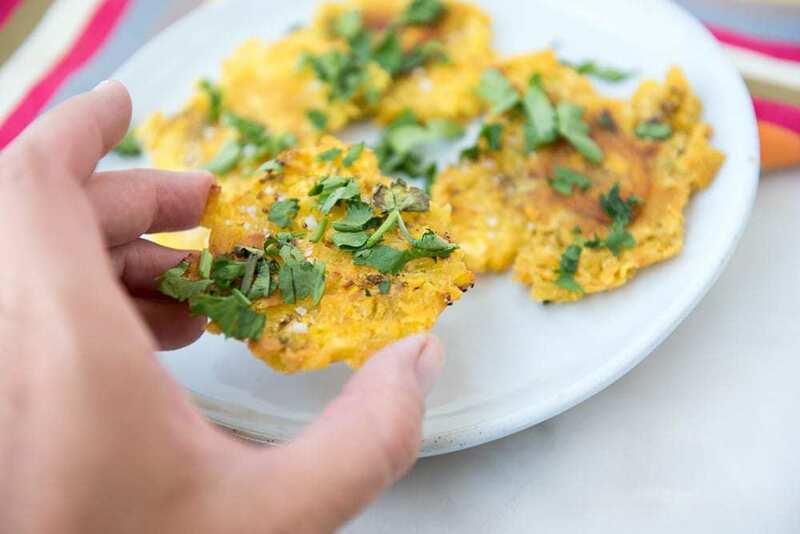 Never tried tostones but certainly will give them a bash – will they work with riper plantains as they only ever seem to sell riper ones in my local market? Any excuse for me to use plantains and I’m involved! Thanks for another great recipe. 10 AIP Breakfast Ideas – Avoid Frustration and Overwhelm With These! 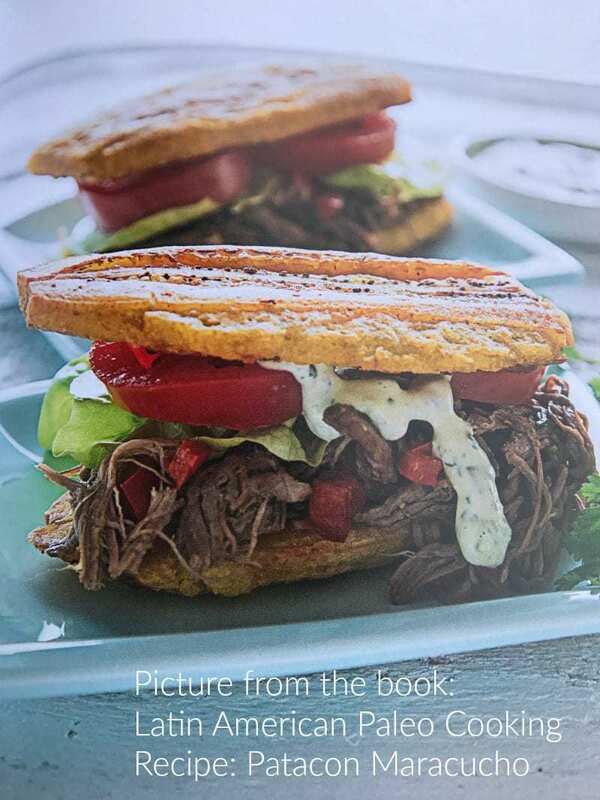 AIP Flatbread Recipe – Make Sandwiches or Wraps!